Before you settle in for the night, entrust your glasses to this porcine pal's snout. 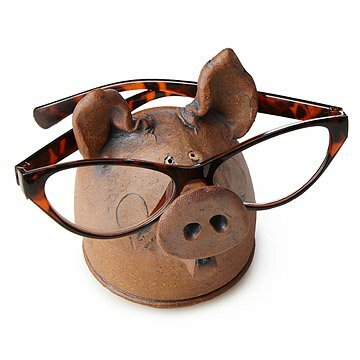 Even if your room can sometimes become a bit of a pig pen, this little piggy is here to help you keep your specs right where you can see them. Before you settle in for the night, entrust your glasses to this porcine pal's snout and he'll be sure to keep a watchful eye over them until you rise the next day. Handmade by Karen and Stephen Steininger out of stoneware in Iowa. Karen and Stephen have been potting for over 35 years. Both have degrees in Art from universities in Iowa, where they currently live and produce their pottery. Creating pieces that can be used and enjoyed everyday is a hallmark of their studio. this was the most awesome product/cute little creature LOL. I will use the pig eyeglass holder for my glasses. Plus I will be purchasing new glasses in June and the eyeglass holder will come in handy.I really this product it is awesome.I may be ordering the bird next. Shipping/Delivery(fast). For my talented, creative but absent minded husband who can never find his glasses. He loves pigs - don't know why - and collects pig memorabilia. The lost glasses problem - solved. And Mr Piggy entertains and delights him daily. And it is a great conversation piece when friends come to visit. Makes everyone smile. This product was well made and makes for a really cute glasses holder. We were proud to give it as a gift. The eyeglass holder works as described. I was surprised to see how small the item was. I realize each one is custom made and may not appear like the one pictured. The one I received was tiny. It is so small that it is mostly just a pig snout with a small head. Absolutely the most clever holder ever! Such a cute pig! This is a work of art! Functional AND attractive, this pig is too precious! We giggle every time he reaches for his specs! The Pig Eyeglass holder is a unique gift. It's a precious handmade gift. I would definitely buy from your site again! My aunt was super excited when she received her gift I sent from your site! Definitely will buy more gifts in the future from this awesome site! This is a very cute way to display eye glasses so you can readily find then. I like to fold mine completely up and just balance them on the nose. I also love the fact that it's hand made in the USA. That's very important to me.